A normal day may start with early morning preparations for an afternoon party. After packing up, you may have meetings with different clients to work out details for their parties. You might cook meals and cakes for your afternoon party. After all the preparations are done you will have to drive to the party location and begin setting up. You may have to coordinate with the caterer and any other entertainment that will be there, like clowns. After the party, you will have to tear down your equipment and return home. There are a few things to consider before you start. First, decide whether or not to have an office and shop. Having space will bring credibility and give you a place to showcase and store your equipment. However, it can be expensive to rent or buy commercial property. Also, consider the different services you plan to offer. 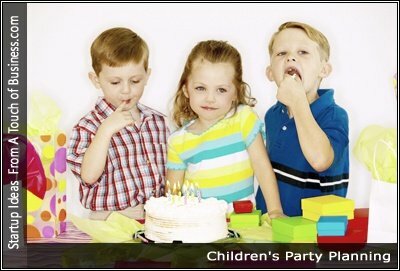 You may only supply games and activities and coordinate with other party professionals such as clowns or face painters. You may need to cater or supply a DJ. The more options you provide, the more business you can bring in; however, special equipment can be expensive to purchase. Finally, consider buying a franchise like Oogles n Googles. This can cost some money up front but gives you name recognition and a proven business model.